I believe this: To improve one's home, to make it uniquely yours – and to want to do so in the best possible way – is a basic human desire, one that often makes my clients' projects a major life milestone for them, one that produces feelings of satisfaction and excitement unlike any other. Contact me and we'll briefly discuss your project over the phone. We'll set up a time for a meeting at your home (or site) to meet each other and go over your project. After meeting you and seeing the project site I get a feel for the scope of design work which will allow me to propose a fee for design and drawings. This will include ample design time to get your project right, and then everything you’ll need for a building permit – stamped blueprints, structural engineering calculations, and the Title 24 energy documents. I usually include some hours in the package to help support your project during the actual construction phase. All these services are provided under one contract, thus streamlining the process. I can leave you with a list of recent clients to call as references, as well as a list of current projects to tour if you wish. If you decide to proceed, we meet again, this time to sign an agreement and get started! It’s also possible to enlist my help with simple hourly consultations at your home or project site. I usually recommend this if the direction the homeowner has for the project is not real clear yet. 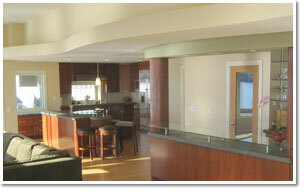 As you first consider a remodel or addition it can sometimes seem there are too many variables to try to sort out. Maybe you are uncertain of bearing walls, plumbing alignment, ease of adding a second floor, or maybe just how to rearrange the various spaces to achieve the flow you’re after. It can be liberating to have misconceptions eliminated and instead have clarity regarding the possibilities and the priorities. I’m available for on-site consulting and just general brain-storming. After these sessions you can take whatever days or months you want to digest the information and mull over any new insights we developed together about how to proceed. 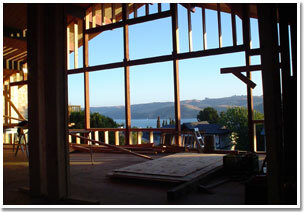 I can help put you in touch with builders I’ve come to know in the area who do good work and leave their clients happy. I have no official or financial ties to these builders, other than mutual respect, and a desire to see my clients have an easy and successful project.